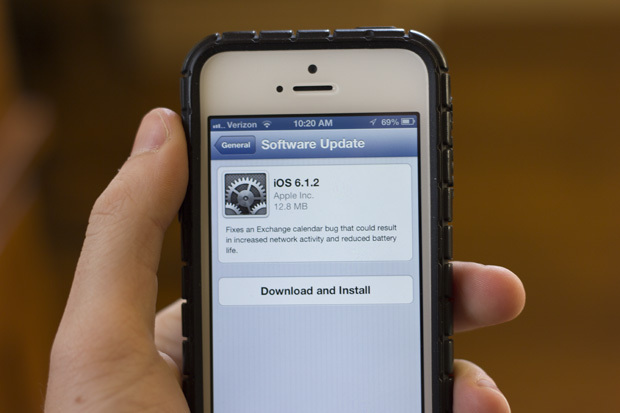 Just over a week after releasing iOS 6.1.1 to iPhone 4S users, Apple has patched yet another bug in the mobile operating system. This time, Microsoft’s Exchange service was not syncing correctly with devices after the iOS 6.1 update. The issue caused a serious decline in battery life by using the devices wireless networking constantly. If you were experiencing this issue, update your device and Exchange should work properly again. Update: Ars Technica‘s Andrew Cunningham reports that this update has not fixed the passcode issue. Also addressed in iOS 6.1.2 is a security flaw that allowed access to the personal files of users without first inputting a passcode. As Jailbreak Nation noted on the 13th of February, anyone can gain access to a passcode-protected iPhone — iPads and iPod touches do not have this issue — in just a few seconds. The process involved using the emergency call function of the device to one’s advantage by calling 911, hanging up, and then quickly pressing a series of buttons — both onscreen and physical — to glitch the device into the Phone app, allowing you to view the person’s contacts, personal voicemail, initiate calls, and even add a new contact of your own. IOS 6.1.2 is a 12.8 MB download on the iPhone 5, but may vary depending on which device you are using. Make sure your battery is well charged and you have a consistent WiFi connection before downloading.